Purnell's and I have not always had a great relationship. Last year, alongside my fellow intrepid food tourists (also known as my dad and my sister), we set off bright and early from Surrey in order to make our way to Birmingham for a 1:30pm lunch date. All was going well up the M6 until we were caught downwind of a large crash outside Birmingham, and were inevitably delayed. Ringing up the restaurant to tell them we were going to be late, they informed us that the kitchen took last orders at 13:45. Regardless of the fact that we had travelled from London just to eat there, were told that no order would be taken past that time. We were desolate and stuck on the motorway, two factors which often go hand in hand. As we drove past at 13:55, I pleaded with Twitter for options, and headed to Lasan. Thankfully, our journey was not in vain as Lasan knocked the proverbial out of the park, so much so that my dad and sister have been hankering for a return journey. So there I was outside Purnells once again, a year and a half later and midway through a mini staycation. Would it be worth it? I can’t say that I felt too excited walking through the front door. I was very excited about the food, not so much the dreary and slightly vacuous interior. As charming as the staff were, the colour scheme of yellow, cream and black was dull, and the large bar area did not feel welcoming in the least. 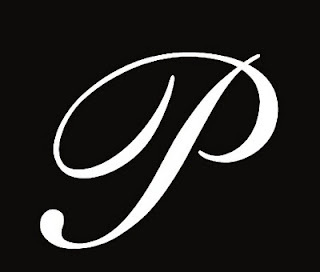 As we were there for one night only, we embarked on the “Purnells Tour”, an eight course tasting menu embracing many of Glynn Purnell's signature dishes, and on paper, had plenty to excite. When were brought bread, it embodied much of what was to come for the rest of the evening. The brown wholegrain roll was soft, light and incredibly moreish, a delightful rendition of a bread roll. However, the accompanying white focaccia was insipid in taste and seemingly just reheated in the oven rendering it slightly stale. 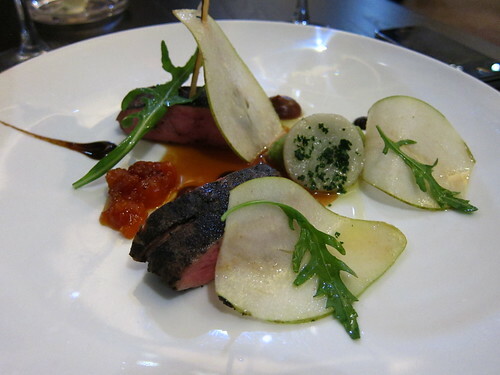 Of all the food we ate that night, the good stuff was astoundingly good. 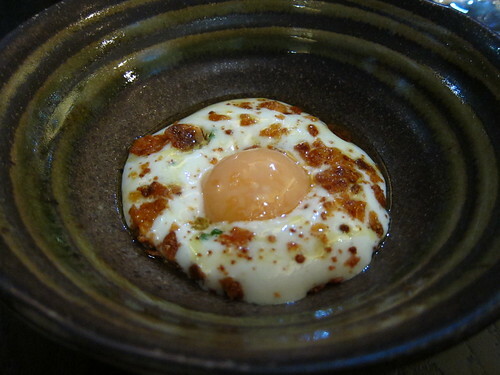 The first course of poached egg yolk was surrounded by a sublime smoked haddock milk foam. Flecks of caramelised cornflakes embodied a playful aspect of breakfast but brought the whole dish together. The poached yolk mingled delightfully with the creamy, meaty fish milk foam ensemble with the flecks of cornflake adding a bit of crunch. 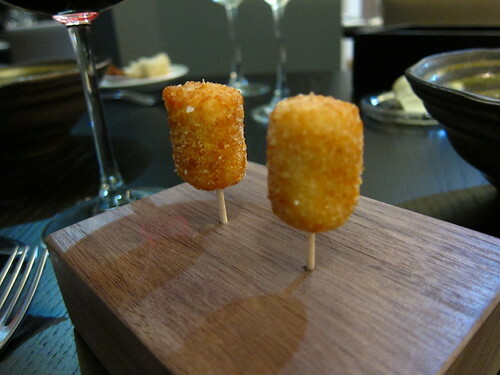 The little haddock croquettes on sticks were slightly superfluous, but tasty nonetheless. 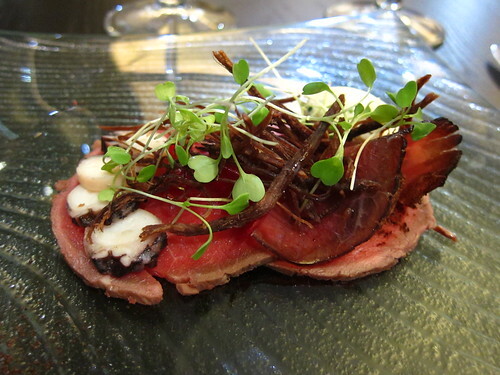 I’ve never been that excited by beef carpaccio in the past, but the one served at Purnell's is something else. Bar the slightly odd addition of a few slices of red wine octopus (albeit rather tasty and tender), the dish was a symphony of beef. Think two ruby red slices of seared beef, topped with a solitary cube of home pressed corned beef and a slice of salt beef bresola, garnished with shards of dehydrated beef and served with a perfect quenelle of the sourest cream you have ever had. Sweet and sour onions added tang and rounded one of the nicest things I’ve eaten in a while. Rounding off the highs were the desserts, each perfectly measured and luxurious. “Chocolate” was exactly that. 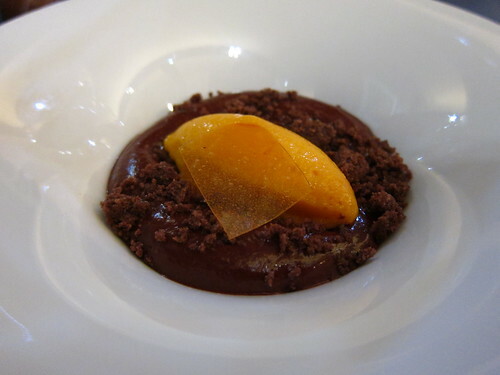 A chocolate mousse with a dab of mango and rosewater sorbet which was so finely balanced that it could have been performing at the big top. 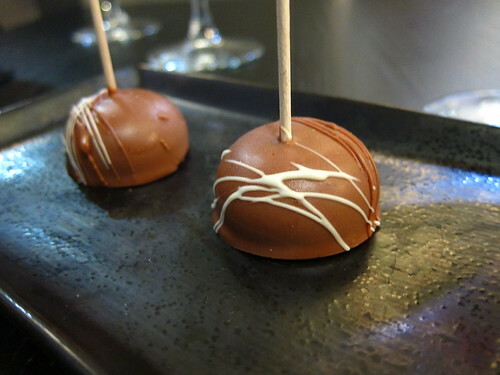 As good as they were, the choc and passion fruit “pops” served alongside were even better, as good as anything William Curley or Paul A Young could ever have constructed, simply amazing. The final dessert of burnt English custard was perfect in its simplicity. 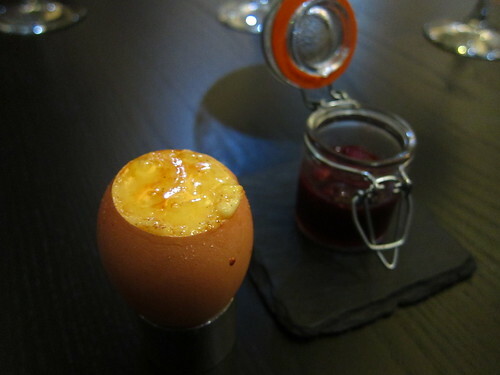 Made famous by the Great British Menu, the custard comes served in an egg and has a brulee topping. Each bite, paired with a mouthful of the Autumn compote on the side was rich and delicious. Sadly, the meal was far from perfect. I guess in any tasting menu, there will always be dishes that may not agree with you, but there were a few proper duds. The Devonshire crab dish was in my eyes, quite badly conceived. I don’t really love crab at the best of times, but the whole dish had little discerning flavour. 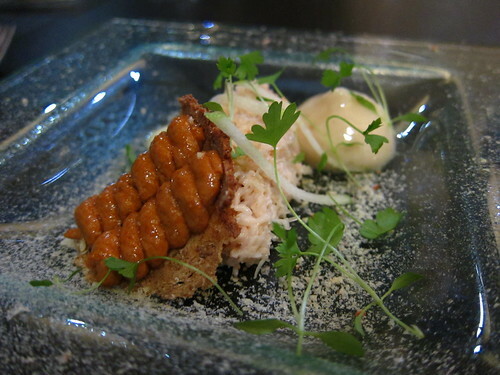 The sweet crab, combined with even sweeter apple puree simply didn’t go, and the “smoked paprika honeycomb” added little additional flavour, surprising for a slick of paprika. The main meat dish was also sadly disappointing. The duck had been “sous vided” to within an inch of its life and had a very odd texture, being evenly soft and chewy. The liquorice charcoal didn’t really lend any additional flavour, and the accompaniments of sweet tamarind paste and thin slices of salty pear (yep, salty pear slices) were just rather nasty. As my friend does not really like duck, her meat was replaced with a slow cooked ox cheek, which lended itself much better to the flavours on the plate. There is no doubt in my mind that the kitchen at Purnells is capable of producing some wonderful food. Out of the eight courses, there were four definite highs, two definite lows and two mehs (not including the amuse and petit fours which were also firmly in the meh territory). This may not seem too bad a strike rate in an 8 course menu, but when you’ve travelled from London (twice) and paid £110 a head, not to mention travel costs and accommodation costs, it doesn’t really represent great value for the traveller. The dinner was to be a roller coaster of flavours and emotions. I had embarked on the “Purnells Tour” and emerged slightly travel sick. Locals should fare better. I still wanna go. I still wanna go. @ Mimi - Definitely worth a visit if your already in Brum, but a big commitment otherwise.